Being close to the Scottish border this area has witnessed many battles between the English and Scots over the centuries. 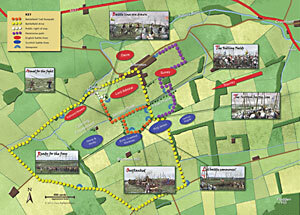 The most significant was this one, the Battle of Branxton Moor or The Battle of Flodden as it is more commonly known. 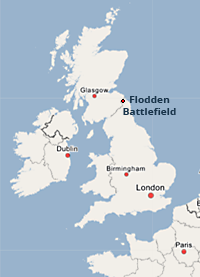 Flodden Field was once the scene of battle, carnage and enmity, but now its bloody history is intertwined with a sense of peace and reconciliation. The warring Borderlands of the past have given way to modern farming practice and tranquil village life. Yet you can still imagine the events five hundred years ago, and perhaps begin to empathise with those who played a part on that fateful day. This website is dedicated to educating and informing visitors and local residents alike and aims to nurture an understanding of the significance of the battle in a wider historical context.  The battle is illustrated by a series of information boards located along a circular walk. The monument to the battle on Pipers Hill was erected in 1910. 14,000 died in the space of less than four hours. Click here to read customer reviews of our book, "Why & How", and DVD "Then & Now". 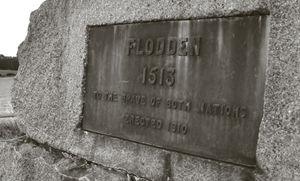 Click here to view a selection of Battle of Flodden merchandise available from the Remembering Flodden shop, and view the trailer for the DVD "Then & Now".